In areas subjected to extreme high winds like the hurricane or tornado regions of the United States, one particular type of catastrophic damage which occurs is the separation of the roof from the walls. Patents assigned to Hurricane Harness® Corp. are engineered to securely protect against roof separation to structures built in high wind zones. Traditionally, roof trusses or rafters were simply installed by carpenters by toe-nailing into place the frame to the load bearing walls. 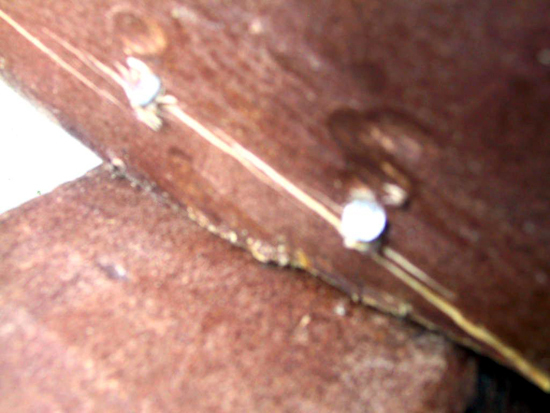 This technique would often cause splitting (photo) and provided no structural strength to the connection. From this, building codes now require rafters or trusses to have metal strap connectors. Such building code enhancements have successfully reduced the total-demolition of damage to wood framed roofs. However, this provides little comfort to wood framed roof systems built prior to the 1993 building code.enhancements. 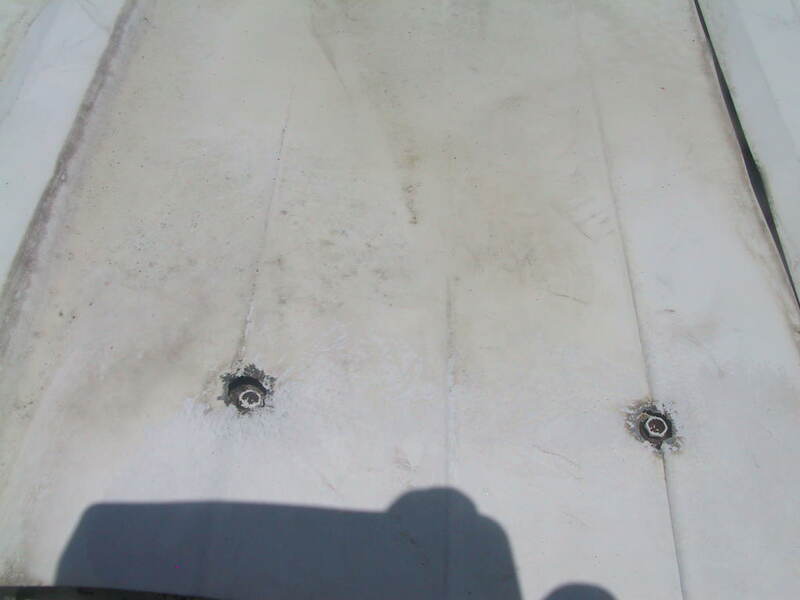 When interlocking metal roof systems found on Commercial/ Industrial Buildings or Mobile Homes are exposed to extreme high winds, irreparable damage occurs to the overall building once the fasteners attaching the metal roof panels to the structural frame begin to tear or rip through the metal pan base, (photo) under pressure differentials of the high velocity winds passing over the surface plane of the roof. This event becomes compounded by the high velocity winds entering through windows, doors, carports or other building add-ons, forcing the underside of the roof panels to lift off. Engineered for outstanding strength and durability since 1998, all our Hurricane Harness® tied-down structures throughout the United States are standing testimonials to an easy, cost effective way to protect your home or business before a hurricane hits. Visit Real Stories for testimonials about Hurricane Harness®. 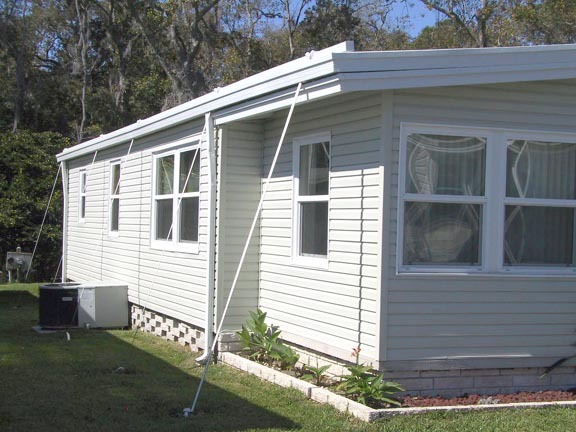 The manufactured housing industries' vulnerability to stand up against extreme hurricane force winds in the United States has now been re-invented by Hurricane Harness® Corporation. 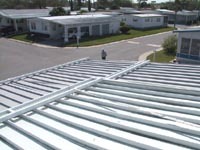 When interlocking aluminum metal pan roof systems are exposed to extreme high winds, such as a hurricane or the outer band winds of a tornado, unrepairable damage occurs to the overall building once the fasteners attaching the metal roof panels to the structural frame begin to tear or rip through the aluminum metal pan base, under the pressure differentials (lift) created by airfoil (vacuum) as a consequence of the high velocity winds passing over the surface plane of the roof, a similar event like the wing of a aircraft lifting. This event becomes compounded by the high velocity of wind entering the carport or other building add-on causing a form of (wind capture), a formative release of energy, like the burst of a balloon, forces the underside of the roof panels to lift off resulting in complete devastation to the roof system, in addition to the roof line/siding section, where developments may become less than a desirable situation to the overall building, the interior building contents, and most importantly, to the homeowner. 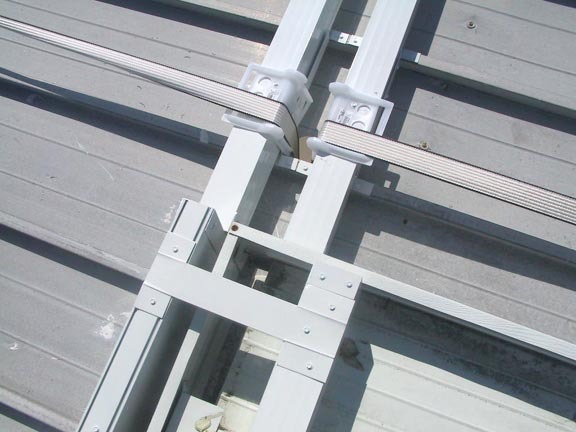 To mitigate this negative force of pressure differential, special pre-installed aluminum tubular channels are permanently fastened perpendicular across the top of the interlocking ribs as shown below, without disturbing the flow of rain water, then variable lengths of our extremely strong, specially designed straps are placed over the channels and fastened into ratchets on both sides of the building then tightened. This method insures a positive downward force is applied to the channels evenly across the top of the entire roof system. The structure literally becomes sandwiched within the strapping and the anchors in addition to providing a positive active dead load to the outer wall systems and the column supports, increasing the resistance to the lateral wind force being applied to the main structure during extreme high winds. The Commercial and Industrial Building's vulnerability to stand up against hurricane force winds in the United States has now been re-invented by Hurricane Harness® Corporation. 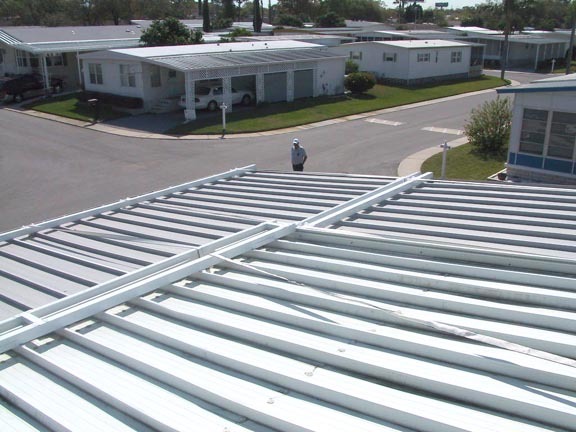 Our patent design for large span, open floor roof structures is similar to our mobile home safety and security method, however, when distance between eave to ridge exceeds 100 ft. in distance, our patented vertical strap displacement brackets are required. Contact our Commercial Division today, for further information on how we can help prevent business interruption, lost productivity, lost inventory or machinery to your company, this hurricane season. “For this specific installation, this load represented an increase in resistance to this particular failure mode that would correspond to resisting a 20% increase in wind speed”. Based on the test results in comparison to the minimum wind speed of a Category Four Hurricane, 131 mph. Hurricane Harness® provides a 20% increase or equivalent to 26 mph in wind speed resistance before roof failure begins. Combine 131 mph + 26 mph = 157 mph; a Category Five hurricane. 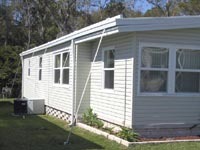 The Only Way to Protect Your Home from Category Five Hurricanes! 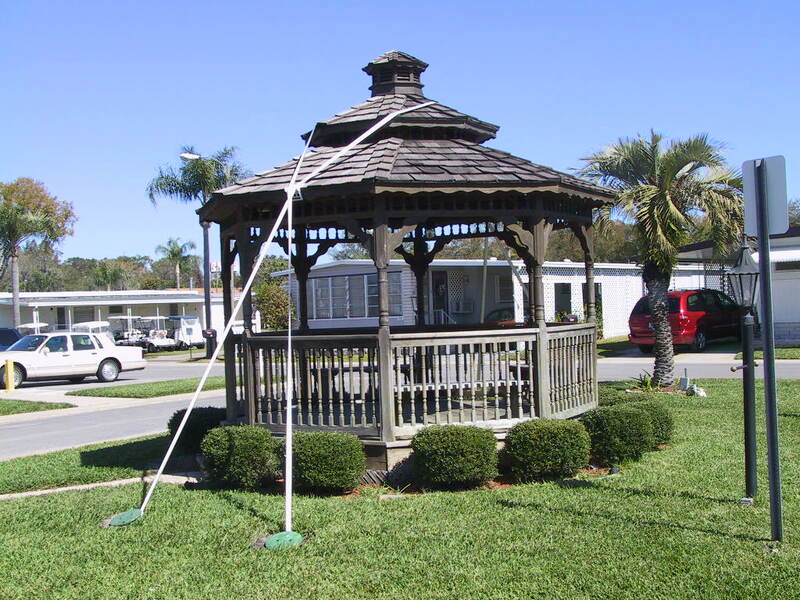 Or virtually any item unsecured and susceptible of blowing over or away during a hurricane. hurricane protection for your home or business.